Women, blacks, Asians and Hispanics have built up substantial positions as business owners in several sectors of the U.S. economy. But based on revenue, those businesses are on average considerably smaller than white- or male-owned firms, according to a Pew Research Center analysis of recently released data from the U.S. Census Bureau. Overall, men owned more than half of the nation’s 27.6 million firms in 2012, according to preliminary results from the Survey of Business Owners, and women owned more than 9.9 million businesses, about 36% of the total. The remaining 10% of firms were either jointly owned by men and women or could not be categorized by gender because they were publicly traded companies or have large, diverse ownership groups. The data for the Census Bureau’s twice-a-decade survey includes all firms — incorporated or not, with and without paid employees — with receipts of $1,000 or more in 2012. A handful of firm types are excluded, including farms, railroads, funds and trusts, churches, foundations, civic groups and professional organization, the Postal Service and the Federal Reserve. About two-thirds of the 1.75 million businesses in the survey sample responded. Women-owned firms made up sizable shares of some industries. For example, more than half of all firms in the health care/social assistance and educational services industries were owned by women in 2012. Women also owned more than half of the businesses in the miscellaneous “other services” category. The combined sales of all women-owned firms in the country, for instance, were $1.6 trillion in 2012 – 11.3% of the $14.3 trillion in total receipts reported that year by all classifiable firms. Male-owned firms had 79.2% of total classifiable sales; those whose ownership was equally male and female had 9.5%. Although 64.5% of classifiable health care and social assistance firms were owned by women in 2012, those firms received just 19.9% of that industry’s $703.5 billion in total classifiable revenues. Among classifiable educational-services firms, 56.9% were women-owned but they took in only 28.1% of the industry’s classifiable revenues. Mining, quarrying and oil and gas extraction stood out among the major industry groups: Women-owned businesses in that industry had a greater share of classifiable revenues (18.8%) than they represented as a share of all classifiable firms (17.7%). 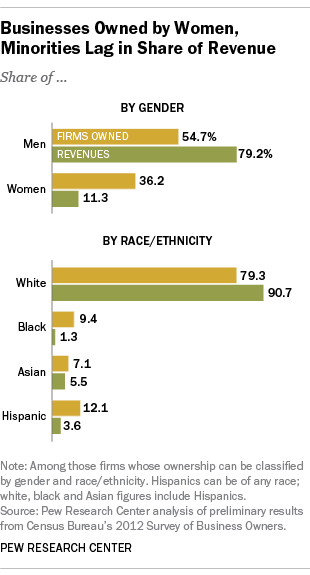 Overall, about 29% of firms (nearly 8 million) were owned by blacks or Asians. About 12% were owned by Hispanics, who can be of any race. Sales at minority-owned businesses as a group totaled nearly $1.6 trillion in 2012, or 10.9% of all classifiable revenues. About half of those sales went to Asian-owned firms, who accounted for 5.5% of classifiable sales and 7.1% of classifiable businesses. The 12.1% of classifiable businesses with Hispanic ownership received only 3.6% of classifiable sales, or $517.4 billion. Fewer than one-in-five of all firms (19.6%) had paid employees in 2012, and those that did were considerably larger (averaging nearly $6 million in annual sales, versus less than $48,000 for firms with no paid employees). Among firms with employees, women-owned firms employed fewer people on average than male-owned firms (8.5 versus 13.5); minority-owned firms had smaller payrolls (8.4 employees on average) than non-minority-owned firms (12.6 employees).